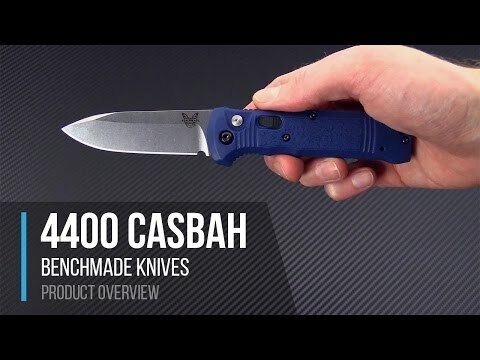 The Benchmade Casbah is a lightweight auto designed with function in mind. The quick action release and high traction grip make this folder perfect for the everyday to the extreme. 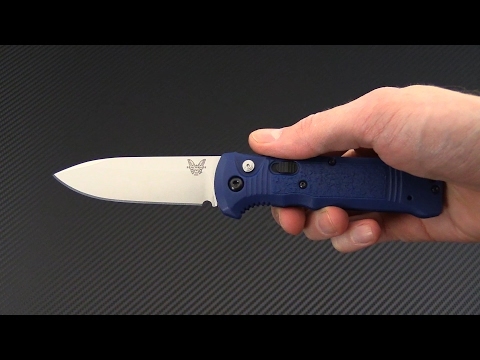 Brand new directly from Benchmade Knives. The Blade: A utility style CPM-S30V drop point blade offers exceptional cutting and wear resistance capabilities. Nearly instant access with the push of a button, the robust action jolts the blade into the open position. Satin and lightly tumbled finish with razor sharp plain edge. The Handle: Extremely lightweight for it's mid-size, dark blue textured Grivory offers a comfortable grip and solid purchase. Partial inset black stainless steel liners provide stability while adding nearly nothing to the scale. Push button for automatic opening found where the thumb would naturally rest for opening along with integrated safety. Reversible tip-up stainless steel pocket clip attached for carry.